FLDS church member Willie Jessop says that the state of Texas doesn't have a single teen girl in custody who cries "please save me". 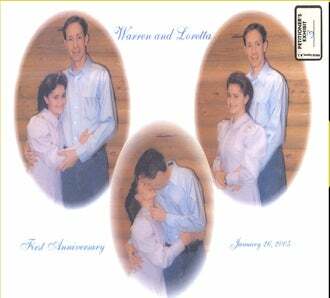 (And the preteen in these pictures with spiritual husband and former FLDS guru Warren Jeffs does look happy, doesn't she???) So it's curious, then, that fellow FLDS member Dan Jessop refused to be filmed by CBS News holding the photos seen at left after they were introduced into evidence by Texas authorities in the state and sect's ongoing custody battle, perhaps because the photos depict his little sister in Jeffs' arms. This is the rub of the Texas trial — everyone is fairly certain that sexual abuse is happening, but the evidence is still circumstantial (a Texas appeals court ruled that the removal of children from the Yearning For Zion Ranch was improper last week). However, Texas officials now fear that FLDS families will flee the state, according to the AP. The state is appealing the court's ruling, claiming that since DNA testing has not been completed, returning children to their parents could be exposing them to sexual predators within the community. Willie Jessop, who is the FLDS point man in dealings with Texas officials, says that what's happening to his brethren is "un-American," and that the idea that his religion condones sexual relationships between grown men and underage girls is "the biggest bunch of bull crap that's ever been sold to this nation." But what about the "bull crap" that's been sold to the young girls of the FLDS, trapped in their long-skirted, fertile prisons, too scared to speak out? It's pretty clear at this point that the state of Texas made major missteps in the YFZ raid, but the idea of subjecting women and girls to this continued treatment is untenable.